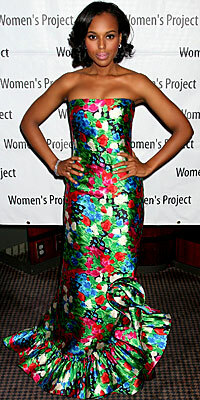 For my next addition I will be profiling American actress, Kerry Washington. Kerry Washington is utterly fab to me. She is a good actress, having worked on films such as : The Last King of Scotland, I Think I love my wife and Save the Last Dance <–Okay maybe not her best acting work, but I know all of you guys have seen her in that one lol. Her style is totally relatable to me because she can take the fashion risk and pull it off. She knows how to mix color, texture and print into her wardrobe and for that, I love her. It was so hard to just pick a couple, I could have went on and on. I dare someone to tell me she’s not fly! Well this is the start up of a new section I’m going to name “Style Star”. If you didn’t know I heart Fashion and Fashionable people. So why not post people I think deserve a gold star and a cookie for their fashionable moments?Well without further adieu… let’s get it poppin!